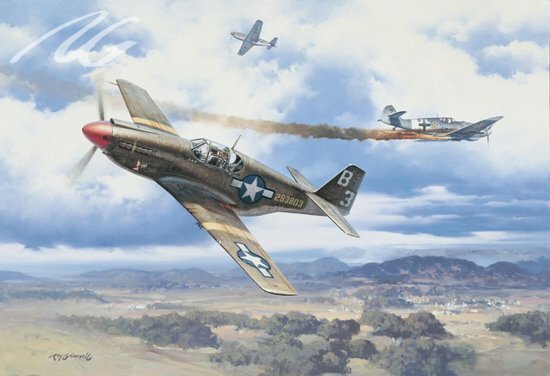 Limited Edition of 1,250: $150 Size: 24" x 30"
"A Record for Russo" is hand signed by Ace 1st Lt. Michael T. Russo, 27th Fighter-Bomber Group, 522nd Fighter-Bomber Squadron. The legendary Mustang was designed for the British Royal Air Force, who took it into combat in July 1942. Belatedly accepted by the U.S. Army Air Forces as the P-51A, the USAAF made limited use of the Allison-engine fighter as a reconnaissance and ground-attack aircraft. Fitted with the wing-mounted dive brakes, the P-51A became the A-36, and was sent to the Mediterranean in early 1943 to equip the 27th and the 86th Fighter-Bomber Groups. Assigned to the 27th's 552nd Fighter-Bomber Squadron, 1st Lt. Michael T. Russo, from Cleveland, Ohio, scored his first victory in the dive bomber version of the Mustang on 13 September 1943, scored another in October and a third on 8 December, enroute to Ferentino, Italy to bomb a railroad station, Russo's flight was attacked by 16 Me-109s. Russo tagged onto a '109 as it dove past and, firing a long burst into the plane, watched it spin into the ground. Warned of a second Messersmitt diving on him from behind, he racked his Mustang around and blew his attacker out of the sky. His fifth victory made him the first Mustang ace and the only A-36 ace in World War II.